Virtually any Exterior type APA panel can be used for concrete formwork because all such panels are manufactured with moisture resistant adhesive. For concrete forming the plywood industry produces a special product called Plyform®, which is recommended for most general forming uses. The term is proprietary and may be applied only to specific products which bear the trademark of APA – The Engineered Wood Association. All Plyform panels have Exterior bond classification, made with C or better veneer and moisture resistant adhesive. Overlaid panels, including “Medium Density Overlay” (MDO) and “High Density Overlay” (HDO) may be manufactured for concrete form use and, if so, are designated “Concrete Form” on their trademark. Always insist on engineered wood products bearing the mark of quality – the APA trademark. The mark signifies that the manufacturer is committed to a rigorous program of quality verification and testing and that products are manufactured in conformance with an APA or national standard. Many imported and off-grade panels never undergo product qualification testing and may not meet the strict criteria necessary for the intended application. 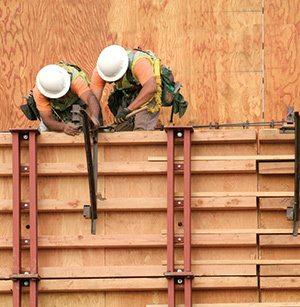 APA completed tests on six batches of Asian overlaid plywood intended for use in the concrete forming industry. These panels were sampled from five different areas of the U.S. Even with this small sample size, the testing demonstrated the wide range of variability of non-certified, imported products sold for concrete forming. Without a credible certification mark showing conformity to a standard, the end-user has no assurance of good panel performance. Plyform is manufactured with Exterior bond classification plywood and is limited to certain wood species and veneer grades to assure high performance. Products bearing this specific identification are available in three basic grades: Plyform Class I and Structural I Plyform. Each may be ordered with a High or Medium Density Overlaid surface on one or both sides. This concrete forming panel is made with Group 1 wood species throughout – the strongest. All other factors being equal, it will support the highest loads both along and across the panel. It is specifically designed for engineered applications and is recommended where face grain is parallel to supports. 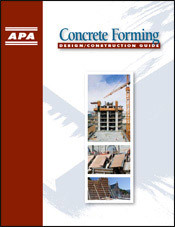 For load capacities, see Tables 5 and 6 in APA Design/Construction Guide: Concrete Forming. Plywood is manufactured in many surface textures, ranging from polished HDO plywood to patterned board-and-batten siding panels. 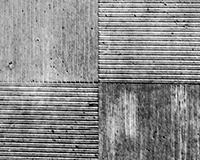 When working with these special panels, and with field-applied patterns, virtually any texture can be created. Textured plywood having an Exterior bond classification usually is applied in two ways in formwork design: (1) as a liner requiring plywood backing so that the liner delivers texture, but contributes little to the structure of the formwork, or (2) as the basic forming panel. For more information on tolerance, refer to APA Design/Construction Guide: Concrete Forming. 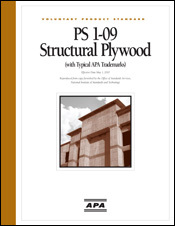 Structural plywood is an engineered product, manufactured to exacting tolerances under Voluntary Product Standard PS 1-09 – Structural Plywood, Form L870. A tolerance of plus 0.0 inch and minus 1/16 inch is allowed on the specified width and/or length. Sanded Plyform panels are manufactured with a thickness tolerance of plus or minus 1/64 inch of the specified panel thickness for Performance Categories of 3/4 and less, and plus or minus 3 percent for Performance Categories greater than 3/4. Overlaid Plyform panels have a plus or minus tolerance of 1/32 inch for all Performance Categories of 13/16 and less. Panels with greater Performance Categories have a tolerance of 5 percent. measured corner to corner along the diagonal, for panels 4 feet and greater in length. shall fall within 1/16 inch of the panel edge. For more information on tolerance, refer to APA Design/Construction Guide: Concrete Forming. The best method of ordering Plyform is to state the Class, number of pieces, width, length, Performance Category and grade. For example: “APA Plyform Class I, 100 pcs. 48 x 96 x 5/8 Performance Category, B-B Exterior type, mill oiled.” Concrete form panels are mill treated with release agents unless otherwise specified. Even so, it is good practice to indicate treatment requirements when ordering.